Abercrombie & Fitch is taking its logo off merchandise as brands become less important to teens. "Logos that are across your chest are totally out," one young buyer said. For young job seekers this summer there is not much to celebrate. American retailers, which have traditionally staffed up in summers, are closing at an unprecedented rate. Over 3,500 stores have closed already this year, with at least 10 well-known retail chains filing for bankruptcy protection. These include RadioShack, Payless Shoes, and Rue21, which plan to close over 1,000 stores this year. 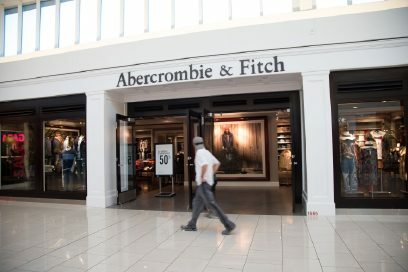 Other mall regulars like American Apparel, Abercrombie & Fitch, BCBG, and Guess plan to close hundreds more. Since last August, Macy’s, J.C. Penny, and Sears have announced they are closing nearly 400 stores, with the latter admitting it’s on the verge of bankruptcy. Because of these retailers’ outsized importance as mall anchor tenants, their pain trickles down to other nearby stores. The Bureau of Labor Statistics tracked 26,000 job losses at traditional retail stores in February alone. Once a symbol of youth summer jobs, malls are becoming a memorial to them. This retail apocalypse is occurring for several reasons, including the fierce competition from online retailers and a slew of state and local minimum wage increases that eliminate scant profit margins. American cities with Amazon warehouses will probably fare alright, but the rest of the country is seeing its retail jobs disappear because of them. Even traditional summer job opportunities that aren’t in direct competition with Amazon are disappearing. Many movie theaters now use ordering kiosks. Grocery and convenience stores have self-checkout lines. And major restaurant chains like Chili’s, Applebee’s, and Panera use tablet ordering systems. These are automated tasks that were once performed by a mostly young workforce. The disappearance of these jobs is demonstrated by the data. Less than one in three young Americans ages 16 to19 has a job, significantly below the historical norm. Last year, the nonpartisan Congressional Budget Office issued a report indicating that one in six young American men ages 18 to 34 was either jobless or incarcerated. These negative employment numbers are especially stark given the current strong economy. These starter jobs provide summer workers with more than just a paycheck. A growing research consensus indicates they offer a set of skills that help employees throughout their career. Research by economists at the University of Virginia and Middle Tennessee State University finds that those with early-career work experience earn 20 percent more later in their careers than those without. At a recent speech in Washington, D.C., Federal Reserve System Board Chairman Janet Yellen stressed the importance that early-career work experience has in protecting workers from economic downturns, as well as integrating them into their communities. A recent study in Science found that summer jobs reduce crime, adding to a body of literature illustrating this association. What can policymakers do to help their young jobseekers? The tech and automation trends cannot be stopped. But policymakers can avoid doing more harm by opposing dramatic minimum wage proposals that would outlaw certain job arrangements and accelerate the automation of jobs. Given that labor costs are often retailers’ biggest expense, massive starter wage increases in the $12 to $15 range demanded by activists can push struggling retailers on single-digit profit margins into insolvency. Hundreds of businesses have already been forced to cut hours, lay off employees, or close altogether in parts of the country experimenting with these wage mandates. Young job seekers are facing a perfect storm of employment barriers this summer. Their elected representatives should avoid raising new ones with workplace mandates that weaken the already fragile first rung of the career ladder.